Last updated 05 July 2018 . By Liv Fitzsimons. Making the dreams of street food followers come true, European Street Food Best of the Best Award-winners, Baked in Brick, will be opening its first permanent restaurant in July. 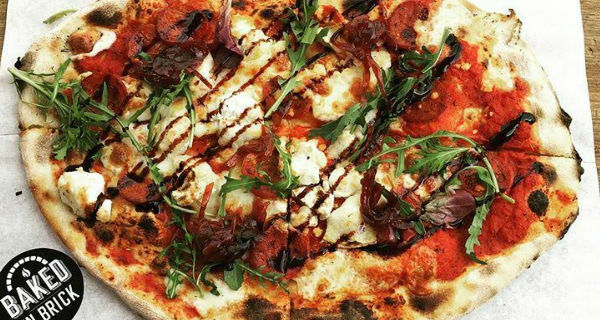 They've traded in their wood-fire oven on the back of a Mini, for a prime spot at Digbeth's Custard Factory, where they'll be serving up the same delicious artisan pizzas, alongside fresh, seasonal salads and charcuterie boards. Equipped with a license to serve booze (wahey! ), the restaurant is also planning to deal out a mean brunch on the weekends (double wahey!). Baked in Brick offer pizza by the slice (for the weak) or whole rounds for everyone else. The perfect oasis for street food lovers looking for the same quality with different scenery, Baked in Brick delivers both. Once you have a beer with their rustic, Neopolitan-style pizza, they'll have you imagining yourself in your favourite market and devouring it as quickly as you can. Translating their reputation for being the best of the best at street food, Baked in Brick look to do the same with their first restaurant.